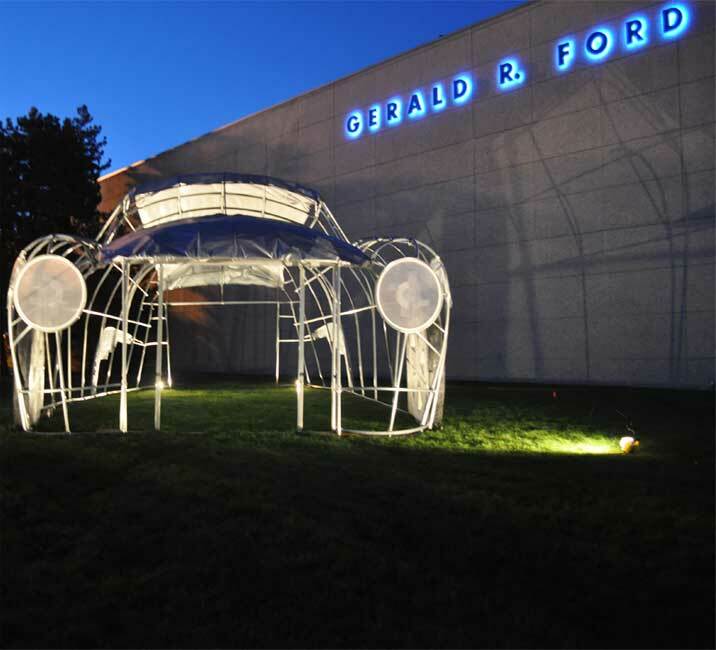 2011 to present, made of green house materials, galvanized, steel tubes, custom bent in the Studio, poly-tarp, poly-carbonate lens sheet with sculpted wheel details of carved foam with concrete, enclosing 40 feet by 20 feet by 14 feet high. 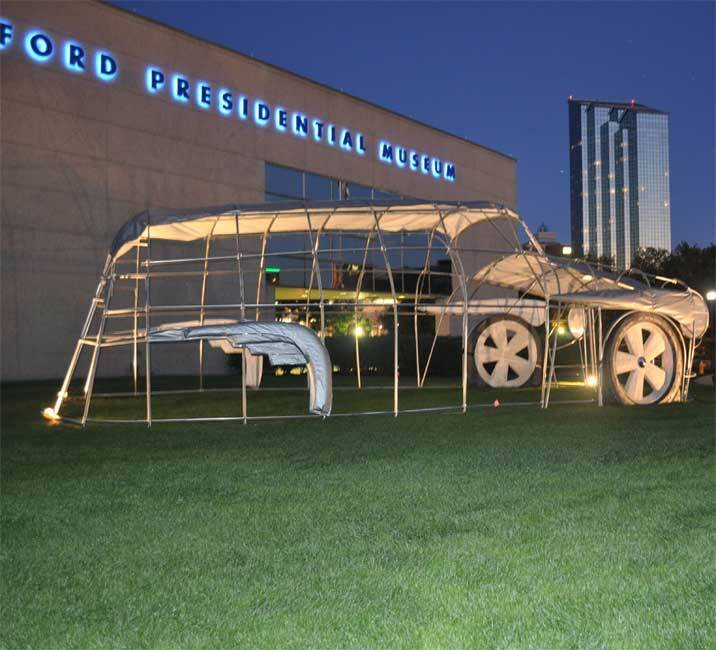 The Big RagTop is a temporary installation concept, designed to be used as a mobile exhibit and workshop space. 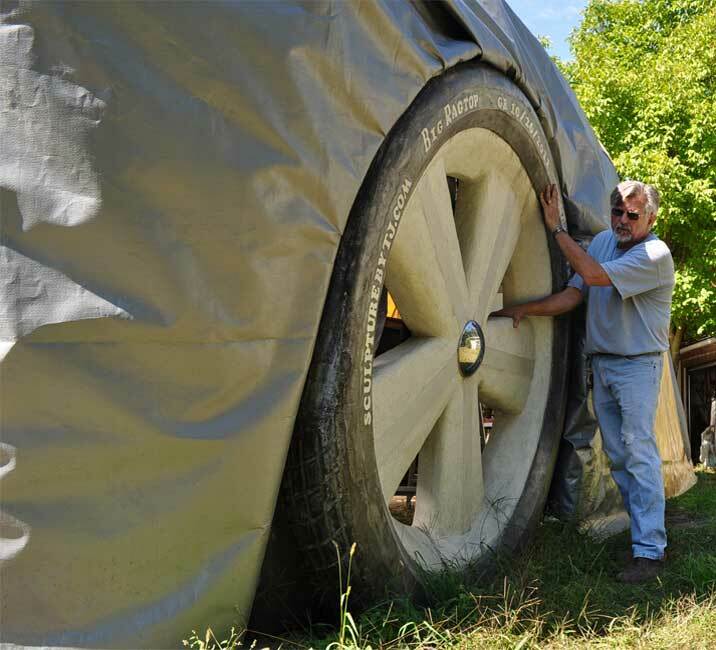 The Big RagTop is a multipurpose building like no other. 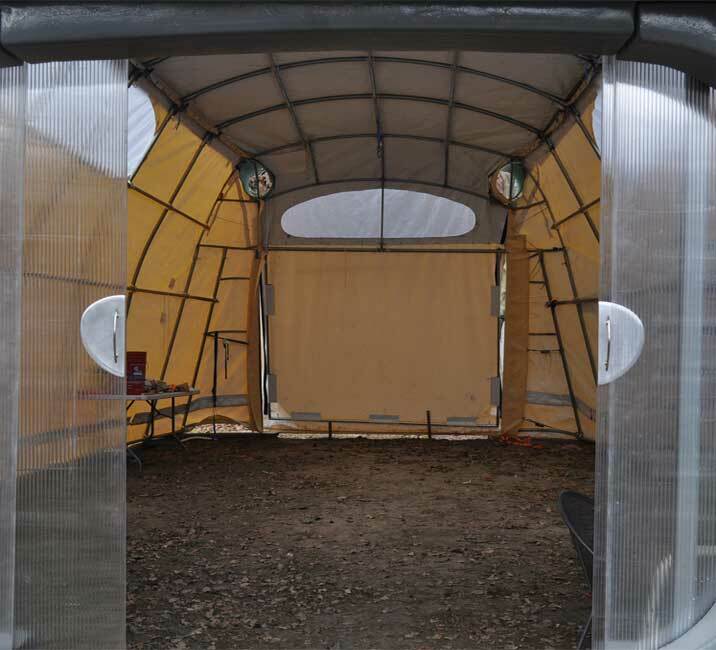 A gallery, work-space, showplace and event tent that can be dissembled, packed into an 18 foot trailer and reassembled in a parking lot, field or urban lot. The traveling show with a big tent has been implanted in our American consciousness by Barnum and Baily. The automobile has enabled us all to travel easily and see shows anywhere. The sense of a cheap fraudulent illusion for the common man is behind the events in the big top. The modern illusion that we each have more importance now resides in our auto centric society that has trashed world resources for this machine. The Big RagTop is a grand object but a little cheap. 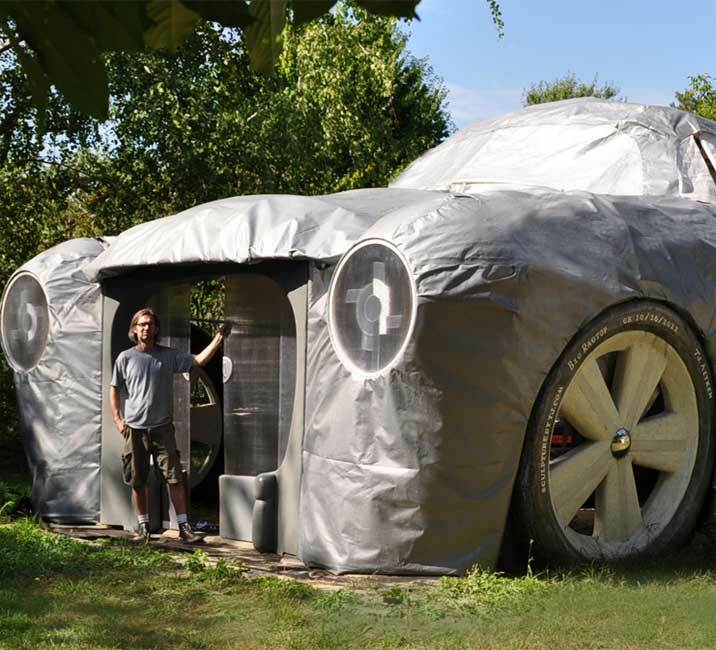 The intent is to do a traveling show, taking the Big RagTop across the US and exhibiting art inside in smaller cities, possibly linking up with car clubs. Background: When the township told me I could not have a bigger studio building I began looking at green houses which are technically temporary (even though they last for decades) and need no building permit. At the same time I had art centers telling me they didn’t have enough space for my Big Sculpture workshops. 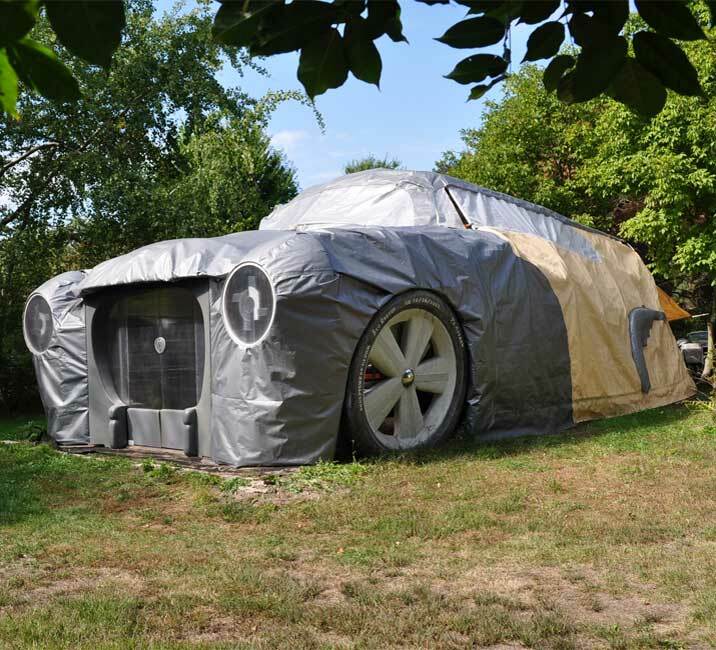 I started thinking about a portable building I could take on the road! 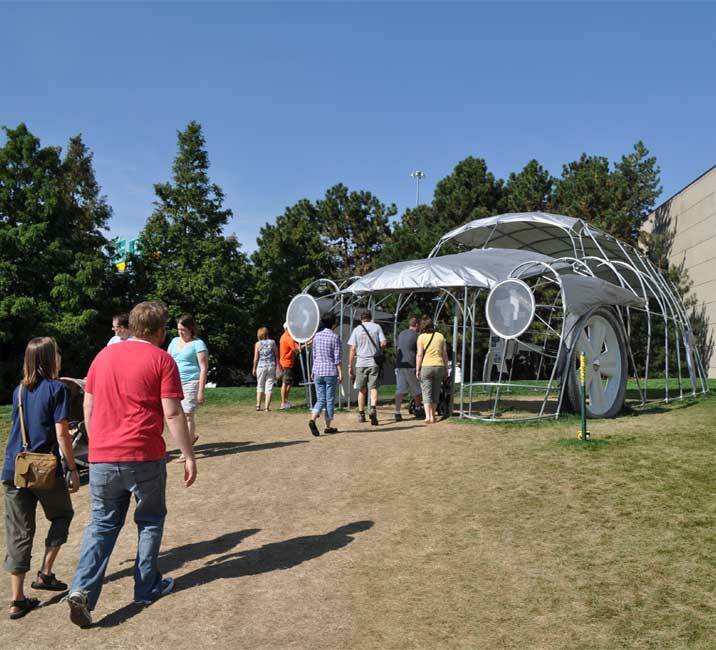 The Big RagTop Concept was sketched up in 2011 and pitched to a few locations for ArtPrize. 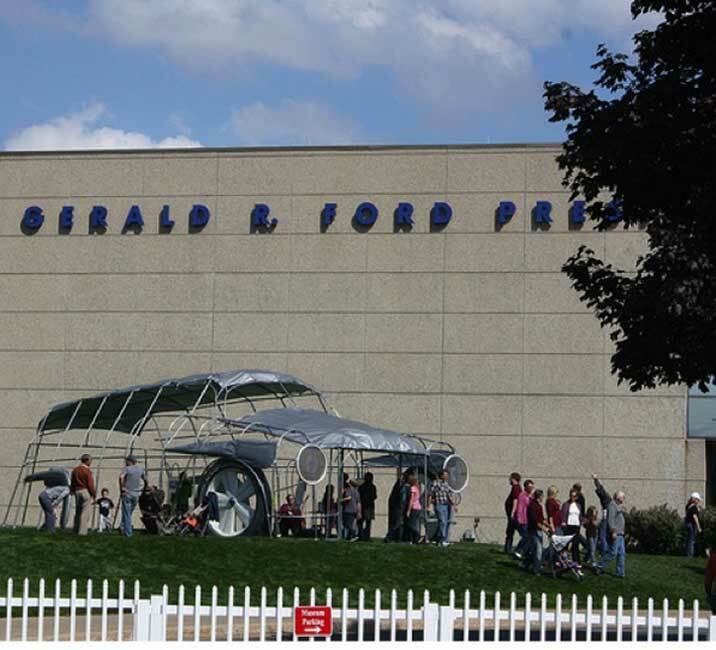 The Gerald R Ford Presidential Museum Curator called in late June of that year. 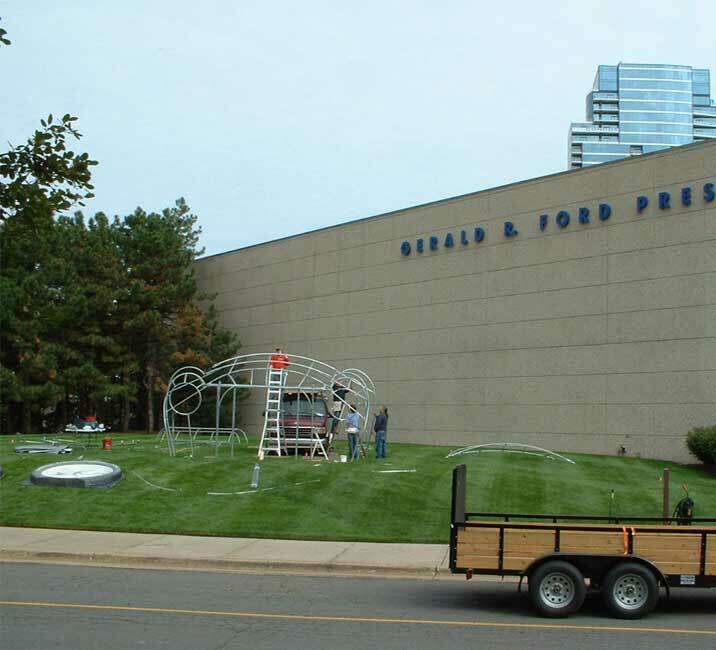 I started the project July 5th and installed the “Pavilion” version on the front lawn September 19th. Much help was had by intern Barbara Isham and friends from Tennessee’s Austen Pea University, Melanie Hildebrandt, Jon Penny. Nathan Conroy, Melissa DeMaagd and Chelsea Cotant also assisted. Lots of assembly help was received from Kim and Aaron Edgil and take down help from Amie Aitken. 250,000 people went into the Big RagTop over a 2 week period and trampled the lawn to brown dust. The Pavilion was removed and reassembled at the Studio grounds where we continued the development of the enclosure. The work came down in 2014 and has not been set up since.